Abram’s Bed, the makers of The Safety Sleeper is pleased to announce an expansion to provide local service in the United Kingdom. The Safety Sleeper is a safe, fully enclosed and portable bed system designed for children and adults with special needs. Sleeping issues, whether it is due to wandering and elopement, entrapment or injury due to falling out of bed, can occur in individuals with a diagnosis such as autism, Angelman syndrome, epilepsy, Smith Magenis syndrome, cerebral palsy, Alzheimer’s and dementia and other special needs diagnoses. 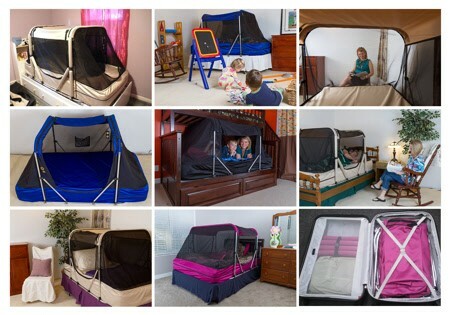 The Safety Sleeper provides the individual with a safe, low sensory environment for not only getting to sleep at night but also a safe den should they require it during meltdowns during the day. The Safety Sleeper also provides safety to sleep walkers. assembly / disassembly (approx. 15 minutes), The Safety Sleeper can be used anywhere, even camping or caravanning! “Expanding to provide local service in the UK is fulfilling a great need in this region where we are seeing a rise in special needs diagnosis. We are so grateful for the opportunity to be able to provide a safe environment for both children and adults to retreat to at night, where they and their loved ones will know they are safe and protected during the night-time hours when rest is so important,” says Beth Machine, Vice President, Operations at Abram’s Bed. Heather Ling serves as the local UK representative, providing service to families as well as medical equipment providers to help families who have loved ones who suffer from sleeping issues. Contact Heather Ling, 0131 450 7124.